With the rise of social media and globalization, fashion is now borderless. From country to country, we’re inspired by international trends which has brought a variety of new color, cuts and styles to our catwalks. The iconic ‘fashion week’ takes place in multiple countries from New York and Milan, to Paris and Tokyo. But, with such different cultures and designer backgrounds, can we truly compare one nation’s fashion week to another? Here, we look at the differences and similarities between the latest Mercedes-Benz Fashion Week in Madrid and the recent Fashion Week in London. 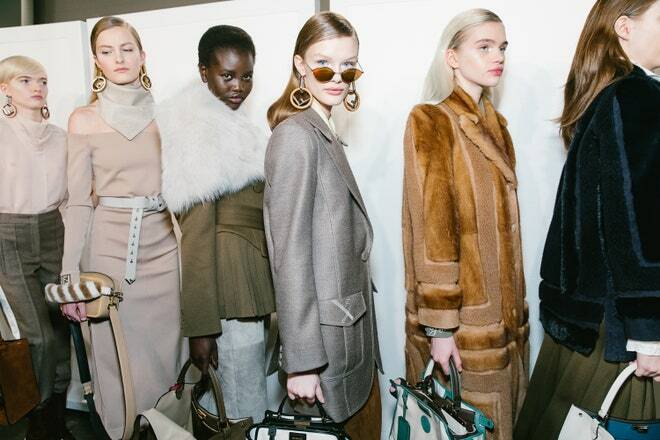 There was an array of colors used in both fashion weeks — from the pops of orange and purple in Madrid’s Pedro del Hierro AW18 collection, to the utilitarian khakis, blacks and creams in London’s JW Anderson range. However, both the strength and the availability of color seemed more extravagant in London Fashion Week, and typically more demure and modest in Spain’s Mercedes-Benz Fashion Week. Take for example Burberry, which presented multi-colored coats, vivid jumpers and rainbow designs to the catwalk in support of LGBTQ rights. Similarly, Jasper Conran made his show explode with magentas, violets, lemons, and limes — sometimes in the same outfit. Perhaps unsurprisingly, London Fashion Week featured far more incidences of Edwardian and Victorian fashion — mainly in the collections by Simone Rocha and Erdem. Tweed fabrics, high necklines, traditional collars, and vintage dresses from the turn of last century and even before made a huge impact at London Fashion Week, while in Spain, the general trend was either for ultra-contemporary or 80s retro. This is a good example of how cultural and historic differences play parts in the styles and designs that walk international catwalks. At London Fashion Week, we saw a distinct trend for 1970s fashion, which included everything from sequin dresses to platform shoes. In London, Michael Halpern’s AW18 collection was spearheaded by disco-inspired clothing — mainly shimmery fabrics and retro jumpsuits. Then, there was London’s Roland Mouret, who brought retro fabrics like velvet and corduroy, and Simone Rocha, who infused her vintage collection with hints of 1970s’ punk culture. The Mercedes-Benz Fashion Week in Madrid instead focused on the emphasized shoulders and metallic materials of 1980s’ women’s fashion. There was even a push towards traditional oriental designs — particularly when you look at the collections from Marcos Luengo and ManéMané. Although, we must mention that, at Spain’s Mercedes-Benz Fashion Week, Ion Fiz did a flawless job of bringing disco-inspired trends to the forefront with clothes and cuts inspired by the iconic Studio 54 club scene in New York City! There were certainly differences between Madrid’s and London’s events. But, what are the main resemblances between these two famous fashion weeks? Both cities showed a huge shift towards retro fashion from the 1980s. From power suits and accentuated shoulders, to pleated skirts and bold prints; major designers in Madrid and London brought back these retro looks with style. Oversized tops and fitted bottoms give the ideal 1980s silhouette, and featured heavily in both fashion weeks; while colorful make-up, high-neck cuts and ruffles — all major 1980s’ women’s fashion trends — were flaunted up and down the English and Spanish catwalks. The Roksanda collection in London and Angel Schlesser range in Madrid both advocated the beauty and appeal of undefined body outlines. From floaty dresses to puffy skirts, this year is set on redefining the feminine shape in Spain and the UK. Multiple AW18 collections in both European countries appear to be focussing on ridding fashion of the typical ‘hourglass’ shape. For example, rather than emphasizing this outline, we see more clothing that accentuates the upper half of the body — most notably in the push towards 1980s fashion. Similarly, there’s been heavy use of tulle in both Spanish and UK collections, which typically puffs out as opposed to clinging to the body. And there’s also been hundreds of silk shirts and dresses that are designed to glide over women’s figures, rather than tightly hug them. A niche aspect of Madrid and London fashion weeks was the tendency to allow other genres of art to inspire clothing collections. For example, the art of dance encouraged London fashion week’s Roksanda Ilincic to create fluid clothing that fitted the body perfectly regardless of movement, while Carolina Menéndez of Madrid’s fashion week used the designs of painter, Mark Rothko, to create an abstract and expressive collection for her AW18 season. Similar to global social movements, the fluidity of art is capable of rousing creativity in multiple areas, regardless of culture or nationality. Look at the stand-out trends from both London and Madrid fashion weeks to inspire your AW18 wardrobe with original styles. When Is It Time To Replace My Home’s Plumbing? Your most welcome, keep up the good work! Really love your blogs! Reblogged this on T h e C h a m e l e o n i c , P r i n t s & P a t t e r n s .
What’s your opinion of Oscar De La Renta? What an awesome post, dear. Thanks for sharing!!! just say no to bringing back the 80’s! lol. Not very much into fashion shows, but this one was a nice piece! As a British person living in Berlin, I’m constantly asked on what I think about the differences between London Fashion Week and Berlin Fashion Week. In my eyes, they’re utterly different. And so they should be! Never been to a fashion week, but I bet it’s crazy! Nice 😊. Real nice. Are you into fashion? Love this post – thanks for sharing this! I love your style of writing. It kept me engaged.